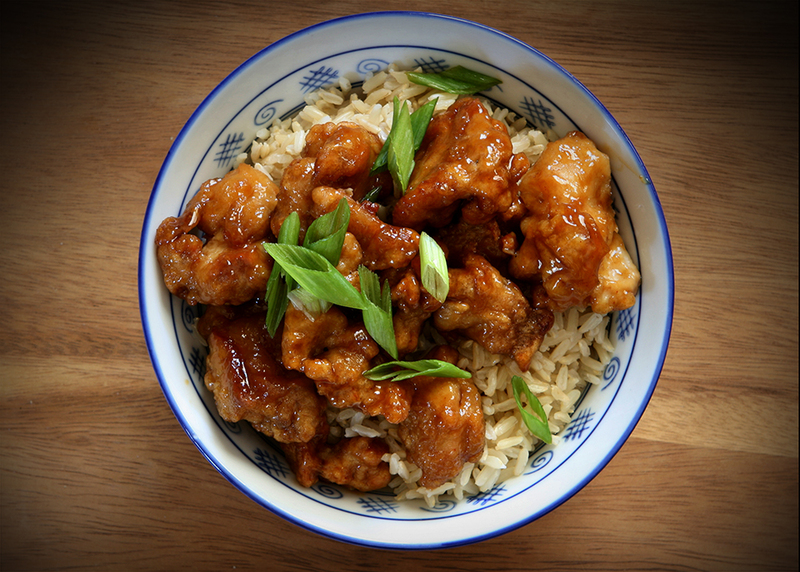 This classic dish is everybody’s favorite while dining out on Chinese food. Our Americanized version utilizes less sugar than normal, we add fresh mango purée instead. The natural sweetness of mangoes mimics caramelized sticky texture this dish is famous for, but without massive sugar amounts. Use fresh red chilies for extra spice. Season the chicken with the salt and pepper, mix together with the egg and the orange zest until all the chicken is well coated. In another shallow bowl, mix together the corn starch and flour.Heat up a large frying pan with the oil to a medium high heat. Dredge the chicken a few pieces at a time in the flour mixture, making sure it’s fully coated with the flour/corn starch mix, and place in the hot frying pan. Moving quickly, fill the frying pan with chicken, turning over after a few minutes of cooking, getting the chicken crispy and golden brown (about 3 minutes). Remove chicken from the pan and place on paper towels, and cook all remaining chicken in the same way, reducing the heat of the oil a little if it starts to get too hot. Drain most the oil from the pan, placing it in a heat proof glass bowl, never discard oil down your sink. Whisk together the soy sauce, mango purée, vinegar and cornstarch until a thick sauce is made. With a small amount of oil in the fry pan, on medium heat, sauté the garlic, red chili flakes and ginger. Add the zest, brown sugar, sesame oil and orange juice and stir well. Once the mixture comes to a boil, gently pour in the mango corn starch mixture and stir well, until it’s a thick and sticky sauce. Remove from heat and toss together with the fried chicken pieces, making sure the sauce covers all the chicken pieces. Serve over rice.